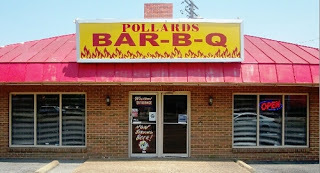 Chef Robert Irvine visits Pollard's Bar-B-Q in Memphis, Tennessee, to help turn around a barbecue restaurant that only 4 months earlier changed from a take out place to a giant restaurant despite struggling with the business. They are in $280,000 of debt and on the verge of losing their house. The restaurant is owned by Tarrance, who wants to keep serving his much loved family barbecue recipes but is neglecting the needs of a large restaurant and has started to cut corners, the food is frozen and pre-prepared. The secret sauce comes from a can and is only slightly modified with a few ingredients added! Robert changes the décor and slims down the menu. Since Robert visited, Yelp and Trip Advisor reviews are mostly good. When Robert revisited a few months later, business was up 20%, the customers love the new decor and the new food on the menu. There has also been a tweak to their signature BBQ sauce to make it more unique. This episode was episode 12 of season 3 and was aired on May 30 2012, there were 13 episodes in the season, airing between February to June 2012 and the season 3 closure rate currently stands at 62%.